It is with a great deal of sadness that I have learned of the passing of Ian Colin James, a fly fishing great, and a long time friend of mine. Ian, who was only 55 years old, suffered a massive heart attack during the night of June 28th, 2015. Although he had heart problems for awhile, it was still a shock to hear of his passing. I have known Ian James for almost 30 years. I will never forget the first time I met him – I was dragged along by my wife at the time to a craft show that was being hosted by her boss at work. I didn’t really want to go, but it was important for her career at the time, to make an appearance. And to my delight, sitting back in a corner, was Ian James creating and selling fly “brooches” – classic Scottish salmon patterns on hooks that were especially made to be used as brooches. They were suitable for both women and men, and often would be seen at weddings because they were so classy. Ian James and I exchanged phone numbers at that event and the rest is history. We became very close friends, and although it is odd that we both loved fly fishing, we actually spent more time drinking coffee together or talking on the phone than we did fishing together. 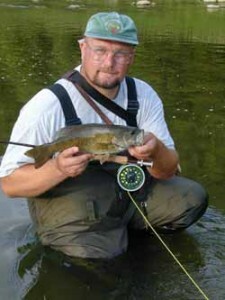 Part of the reason for that is because fly fishing and fly tying was his job. I was always envious of that aspect, but Ian was one of the few that actually made a full time living from guiding and fly tying, and he knew how to do it. Sometimes it was not always so easy, but he managed to figure out ways to promote his services and make some kind of living out of it. Ian was a most interesting person and while he had a wicked sense of humour and was well known for that, I can also attest to a deep caring side that he had. For some years, he lived with a lady that had two children from a previous relationship, and when that relationship ended, it was not the relationship he mourned solely for, but for the separation he felt between a young child named Willie. Ian gave four year old Willie credit for inventing the “puke fly” (which despite its name, catches lots of fish) and I heard Ian literally cry after some time of separation from Willie. When I went through my own family issues, and before the “internet” was much of anything, Ian James was there for me, and one of the first to offer empathy and understanding to how I was feeling. He also became quick friends with my dad, who happened to live in the same town – Guelph, Ontario. My dad would often call me to tell me about flies Ian James had dropped off as a gift, or a meeting on the river, or the pond near the Guelph Jail, and Ian would offer my dad suggestions and advice that would make his fly fishing outing more memorable along with learning new skills to make the next one better. Ian often helped me out with my fly fishing sites (I was once a “Guide” with About.com) and provided material that I could use. But it wasn’t for his own benefit; so often he would go out of his way to help and to encourage. And always with some funny joke. Although his job was his passion – fly fishing – he also went out of his way to do things for others and to help others. He could have charged me a mint for casting lessons for my son Colin, and I would have paid him – but he refused any idea of compensation, especially when it came to sharing his passion with children. He was patient, knew how to teach, and seemed to revel in teaching others the skills that he knew. And figuring out how to teach those skills quickly so there was less frustration on the part of the student. And in doing that, he was also a person that helped others create memories – I have many memories of some wonderful times on the Grand River with my son Colin, who would actually correct me in some of my own bad fly casting habits, because Ian James just had a way to imprint them on your mind in a short amount of time. My own friendship with Ian James went way beyond fly fishing. We talked about many things, and even our struggles at times. He was there for me in a heartbeat when my father passed away. Sometimes there were other life issues, and a 30 minute phone call was enough to help “cut through the crap and get to the point” while also showing a great deal of empathy. And he smiled and laughed.. and would even tie them on to his own leader… and when he caught a fish with one of my crappy flies, he would laugh and give me credit. Rest in peace, Ian – but I have to admit it’s hard to accept you’re gone.. and a little bit of bitterness that we won’t be able to take my 12 year old son David out this summer as we had talked about a few weeks ago, and it’s with tears in my eyes, that I write this. What am I going to do in two weeks time when something happens, and I think, “Gee.. I need to call or email Ian?” For almost 30 years, you were like a brother to me, and although our backgrounds were different, we could joke about them and at the same time, share our love for a sport, but also share both tragedies and triumphs together. And always a good laugh. And no matter what, I always knew I could depend on you. I hope you knew while you were alive, how much I admired you. And how much what you did, meant to me. And even though we sometimes did not agree, there was a loyalty.. that I admired and appreciated. Just a few weeks ago, when I needed some assistance with an issue, you drove out to Orangeville and you were there. And although I knew you missed Willie, you laughed and laughed and talked so lovingly about your nephew in Scotland and related stories .. that made me laugh to, and I knew how much you cared, but even through the caring, life was about finding something to laugh at. I guess I need to thank my ex-wife – and you would find humour in that – for having the chance to meet you and eventually call you one of my best friends. You were larger than life .. and you made others also realize we can also be larger than life, if we stick with what we believe in, and muddle through the crap, which can sometimes be distracting – but get back to what you want and love. I am going to miss you so much, Mr. Ian Colin James. I keep hoping the news of your passing is a mirage, a bad joke, and that like Tom Sawyer, you’ll be there at your own Memorial Service, grinning, and pulling just another silly joke (perhaps we won’t all find it funny..), and next month, I’ll be getting an email from you, or a reply to one of mine, or a phone call… and you’ll be arranging time to teach my son David how to fly cast. And then I shed tears, realizing it’s not a joke. You are gone. And I hope I expressed to you enough, when you were alive, how much you meant to me, over the past 30 years. You were my friend. And the memories keep pouring down. Dam it Ian.. why did you have to die? We have plans , man.. we have plans.. . Thank you for being my friend. I miss you. I’ll muddle through the next 30 years (if I make it that long) with Muddlers, some “Puke Flies,” some Blue Thunders and always some Muncher Nymphs. And think of you. Thank you for your comment, Pat. I was lucky to have been able to fish with him on The Thames. Great memories! Great fish. He will most certainly be missed. While Ian and I haven’t fished much since he moved from Guelph to London, I will fondly remember our fishing trips to the Grand River in the 90’s. Ian was one of the people that taught me to tie flies and flyfish when I started. He was larger than life and always willing to share his knowledge, and his “secret flies”. He was an inspiration and could always get a laugh regardless of what the challenge of the day was. Anyone who knew Ian will feel a huge sense of loss as I do…he was a rare and special fellow. I will toast Ian with a shot of MacCallan 18 tonight in his honor. Jason – good to hear from you. I thought of you and wanted to make sure you knew about this, but we’ve not been in touch for so long, and I lost your contact information. I am glad you found this. Hope you are well. Beautifully written, Ian and I’m crying along with you. This has been a very tough loss. 🙁 I know, Karla. I still can’t believe it myself. I am still quite in shock at times. I had sent an email question to Ian several years ago and he responded with his wit and wisdom. I never personally met him but what impressed me is he took the time to respond. My family is of Quebec decendent here in the states. I was saving $ to go to one of his tune ups. I am sad I can’t follow through this goal. Does anyone have some video on his no- nonsense casting? It seems the world of fly fishing is catching on to the carp father’s wisdom. Hi Tom – thanks for your comment about Ian. He most certainly had a witty style that will be missed by many. I don’t have any video myself – when we went out fishing, we went out to fish 🙂 I regret that I didn’t take some video now. But, the experiences of simply fishing together were memorable and fun. Thanks for sharing your memories. I only just learned about this and am quite touched. Even more so, I’m surprised at how saddened I am at this news as I had only met Ian twice. I had the distinct pleasure of having him teach me how to fly fish and of those 2 occasions caught more than anyone else in the group of course. His heart, soul, and great sense of humour were very easy to see and be completely enveloped in. My sincere condolances to you and his family. Thanks very much for sharing your own memories of Ian, Tracy. That’s a great one… catching more fish than anyone else after lessons from him! He was a very good instructor and time spent with him on the water was always profitable, both in learning or improving skills and for a fun time. Thanks for sharing this. You captured so much of Ian perfectly. I was fortunate to spend some time fishing with him just weeks before he passed. He was the best fly fisherman there was, and had the biggest heart of anyone I’ve ever met. Thanks so much for the comment, Noah. Glad you were able to get out on the water with him before he passed away. Indeed, the big man had a big heart, that is for sure! Very sad news, just heard and will join others in saying what a loss he’ll be for fishing, for laughter, and for his generous heart. Hi Karen… thanks for the comment – yes it is a big loss indeed! Thank you for that exceptional tribute to a life of an obviously exceptional man. I just started fly-fishing this spring (I’m 58) from the influence of my deceased grandfather, an expert at extracting trout from Colorado streams with the Royal Coachman. Last week (October 17-21) I used Ian’s Crunchy Caddis in Oklahoma’s small streams. Panfish simply had to sample that delicacy every time it hit the water. I’d like to thank Ian, posthumously, for the grand enjoyment he’s provided to me. Now that I know a bit more about Ian, I’ll enjoy using his designs with greater satisfaction. Again, many thanks for the tribute paid him. I’m enriched simply by reading about his life. I know I’m a little late with this, just found this while doing a search for one of Ian’s patterns. That was a very well written memoriam. I knew Ian off and on for about 15 years, my dad’s forst time meeting him was at a local tackle shop here in London where he was looking for stuff to start tying flies. I am walked in, and the owner called him over for a bit of help, which of course Ian provided in spades. That one fly led to my dad and I having now tied flies for almost 20 years. I’ll never forget the casting lesson he once have me at Gibbons park, or his constant chastising about the fact I tend to run a 9′ leader vs his preffered 12′-16′. Again, thank you. This story brought up a lot of memories. My dad and I still tease each other about title tailing to Ian when one of us does something we shouldn’t or messes up. Thanks so much for your post, Steven. Appreciate you sharing your memories of our “Big Bald Buddy.” 🙂 He’s still very much missed indeed.